Many of the English idioms we use to this day were invented or popularized by Shakespeare – you’ll learn eight of them in this lesson! 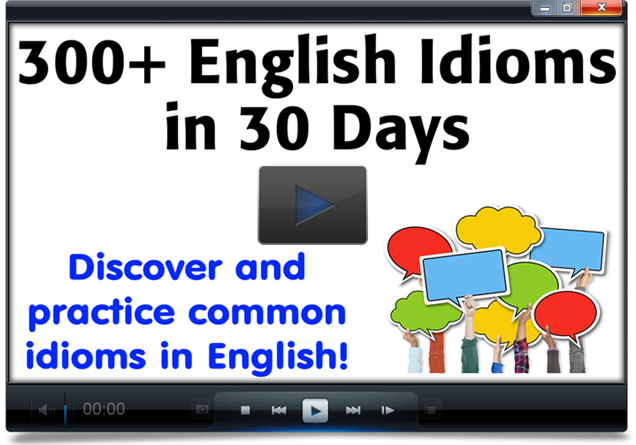 To learn more idioms, join my 300+ English Idioms Course. Let’s say you have 100 unread e-mails in your inbox. If you select them all and delete them with a single click, you have deleted them in one fell swoop – with a single quick action (not slowly or one by one). Imagine there’s a park in your city that used to be beautiful, but due to lack of maintenance it is now dirty and full of trash. You could describe that as a sorry sight. If surveys show that 90% of the population supports one candidate in an election, then it is a foregone conclusion that this candidate will be elected. We often use this expression in the negative form – “it’s not the be-all and end-all” – to say that something is not the most important or the only thing that matters. For example, when it comes to grades, final exam results are not the be-all and end-all – the teacher also considers all the quizzes, homework, and student participation throughout the course. Usually used with the verb “wait” – for example, if your best friend is one of three finalists in a singing competition, you would be waiting with bated breath for the winner to be announced. Let’s say you are going to go on vacation, but due to an emergency you have to cancel it. Fortunately, you get refunds from the airline and hotel – but it’s cold comfort. It’s a positive thing, but it doesn’t make you feel better about the overall situation – the fact that your vacation was canceled. Imagine your sister has a boyfriend who doesn’t treat her very well, and you don’t like him. Finally, your sister gets tired of the bad treatment and breaks up with the guy. You could say, “Good riddance!” because you are glad he is out of your sister’s life. Imagine you have a very old computer, and part of it breaks. You want to repair it, so you start looking for a replacement part in electronics stores, online, etc. But it turns out that part isn’t manufactured anymore – so you’ve been on a wild goose chase (an impossible pursuit).